Understanding the complex legal and ethical principles that govern health information management is more important than ever. To help you successfully navigate these legal issues, LEGAL AND ETHICAL ASPECTS OF HEALTH INFORMATION MANAGEMENT is revised, updated, and expanded, providing the opportunity to focus on law and ethics as they relate to HIM. Key topics include the role of social media in health care, expansion of existing materials on e-discovery, compliance, completeness of the health record, breaches of confidentiality, and much more. Features include enrichment activities, mapping to CAHIIM standards, and interactive quizzing and case studies to help develop practical application and high-level problem solving skills. 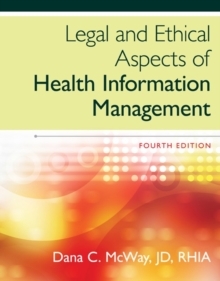 Written by a seasoned HIM professional and lawyer, LEGAL AND ETHICAL ASPECTS OF HEALTH INFORMATION MANAGEMENT, 4th Edition provides a complete solution for understanding the legal and ethical concerns that safeguard health care information today.